Extend the life of your fishing gear by prepping it properly for winter storage. NATURE DICTATES THAT A LARGE number of avid fishermen must store their fishing gear during cold weather. Taking good care of it pre-storage is less expensive than replacement. Here are some tips from the experts on the best way to prolong your tackle’s lifespan. Reel seats and clamps tend to hold salt, dirt and algae like a magnet. 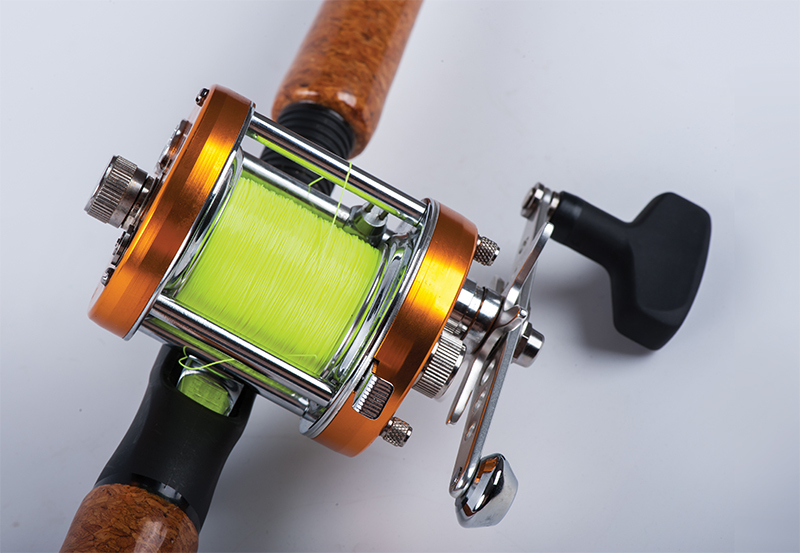 Remove the reel from the rod, then wash and dry both thoroughly, making sure to tighten the drag completely on the reel first, to prevent water intrusion. Today’s rods may be stronger and lighter than rods of old, but they’re also more fragile. Even the tiniest nicks and scratches can cause catastrophic failure. Likewise, ceramic guides, though tough, can fracture, ultimately abrading your line and resulting in lost fish. Inspect your rod carefully for cracks in the finish. My grandfather taught me to run a piece of old nylon stocking through each rod guide. Damaged guides will snag the pantyhose and alert you to the need for replacement. Replacement guide liners can be found at most tackle shops, big-box sporting goods stores and Bass Pro Shops. Other rod storage methods include resting them horizontally on pegs against a wall or suspended in hooks on a ceiling. Both methods require careful installation. The pegs must be aligned at exactly the same height to support the length equally. Likewise, hooks on a ceiling must be aligned so as to not induce a curve in the rod. Secrest additionally squirts some WD-40 on a soft cloth and wipes down metal reel seats and guides. I like to follow that up with a drop or two of gun or reel oil on a rag to coat the metal. And of course, never store a rod with the reel, line and lure attached and under tension. That surely will ruin your stick. Before getting into deep cleaning and maintenance, be sure to remove all the line from the reel. You should be re-spooling it several times a season anyway. Secrest goes considerably further. “I oil all the common corrosion spots with Corrosion X or Boeshield T-9,” he said. Those spots include screws on the reel feet, two-speed mechanisms, the drag tension knob, and both the bolt and shaft of the handle arm. However, he adds, in a salty environment — say, by the beach — reels stored in the garage would be better off in a cupboard, box or drawer. Like rods and reels, all terminal tackle should be washed with fresh water and dried before being returned to the tackle box. If it rains into your open box while you’re fishing, make sure you remove everything and dry it thoroughly. Then add a moisture absorber or three to the box before storing. Storing lures in inexpensive Tupperware boxes layered with paper towels to absorb moisture also works well. All this preventive maintenance will ensure proper winter storage, help prolong the life of your tackle and save you money in the long run, which your significant other will surely appreciate.